Snow Peak Trek Combo Titanium Cook Set is a combination of the popular Trek 900 Titanium and Trek 1400 Titanium series cooksets. It offers the convenience of both cooksets without adding any volume: the 900 Ti set nests into the 1400 Ti set. 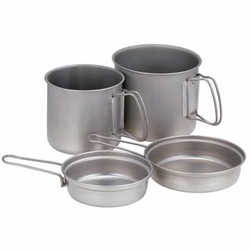 Includes: 900 Pot/ 30oz, Lid/ 5" diam x 1-3/4" 1400 Pot/ 47oz, Lid/ 5-3/4" diam x 1-1/2"